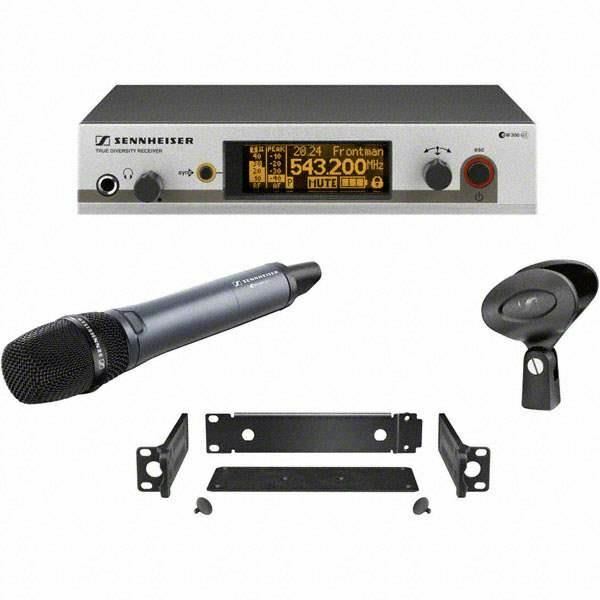 Versatile presentation set: Powerful SKM 300-835 G3 cardioid handheld mic with programmable Mute button, EM 300 G3 true diversity receiver with 1680 tuneable UHF frequencies. Power with control: this system not only ensures vocals cut through, but also provides the user with a programmable mute button on the mic. Add in a backlit graphic display, intuitive menu navigation, and you have a professional wireless system. Enjoy one-touch programming of the transmitter to the receiver via the wireless sync function. The Ethernet jack on the receiver allows for remote PC monitoring and control using Sennheiser's "Wireless Systems Manager" software. The ew 335 G3's hand-held transmitter is perfect for spontaneous dialogue and interviews. Sennheiser e-901 Microphone Kick DrumsProfessional pre-polarized, half-cardioid, boundary layer condenser for bass drum, Leslie and low frequency instrument applications (1 lb 2.4 oz).FeaturesFrequency response optimized for bass drumNo stand needed -- just lay it on a towel or pillowStandard XLR pl..
Shure PGA58-LC Cardioid Dynamic Vocal Microphone..
Audiocore CCS-100D Delegate Conference Mic for CCS-100/CCS-500 SeriesOptimized for the Audiocore CCS-100 series, this Delegate Mic is used for all meeting delegates. This mic can be connected to Audiocore CCS-500 series as well.Technical SpecificationsConference Delegate Unit Parameter (CCS-100D):Ty..